Innovative Hemp Extract Company NEOTERIC NUTRA™, Featured on NEWS WATCH on the AMC Network NUTRA™. 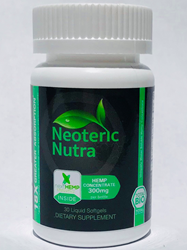 Priding themselves on delivering the very best pure nano encapsulated hemp extract possible, NEOTERIC NUTRA™ brings their BLACK LABEL CONCENTRATE™ to the forefront. "Here at NEOTERIC NUTRA™ we are committed to bringing people the highest quality hemp extract possible. Our innovative black label concentrate formulation will perform better than most, if not ALL other products on the market." - Brian Troch, CEO and co-founder of NEOTERIC NUTRA™. NEWS WATCH recently featured NEOTERIC NUTRA™ on the AMC network and DIRECT TV for the exceptional quality of their product. NEOTERIC NUTRA'S BLACK LABEL CONCENTRATE™ formulation contains the nextHEMP™ technology that was initially developed at Ananda Scientiﬁc, a biotech company led by Chief Science Ofﬁcer and Founder, Dr. Mark Rosenfeld. 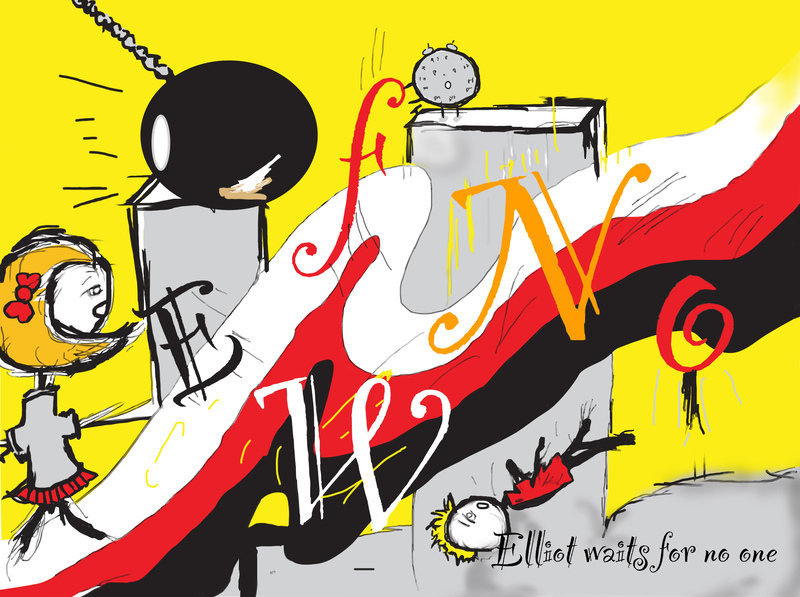 The News Watch segment discussed NEOTERIC NUTRA™hemp extracts and ELLIOTT WAITS FOR NO ONE (EWFNO) which features Brian Troch, Jenny Franck And Jeff Tortora of the Blue Man Group. That album is set for release in the fall of 2018. With all the same technology and benefits the White Label NEOTERIC NUTRA™ formulation has, the concentrate version is up to 24x stronger! The company that is known for delivering relief that can actually be felt within 30 minutes has now topped itself by bringing our strongest formulation to the masses and will perform better than most, if not ALL other products on the market. Containing the multi-patented technology of nextHEMP™, NEOTERIC NUTRA'S BLACK LABEL CONCENTRATE™ encapsulates and protects the hemp extract from degrading in the stomach, which allows more CBD to reach its targets and maximize effectiveness. NEOTERIC NUTRA™ concentrate only requires 10mg for fast-acting results. Fully water soluble, Neoteric Nutra efficiently is absorbed into the bloodstream at almost 100%. 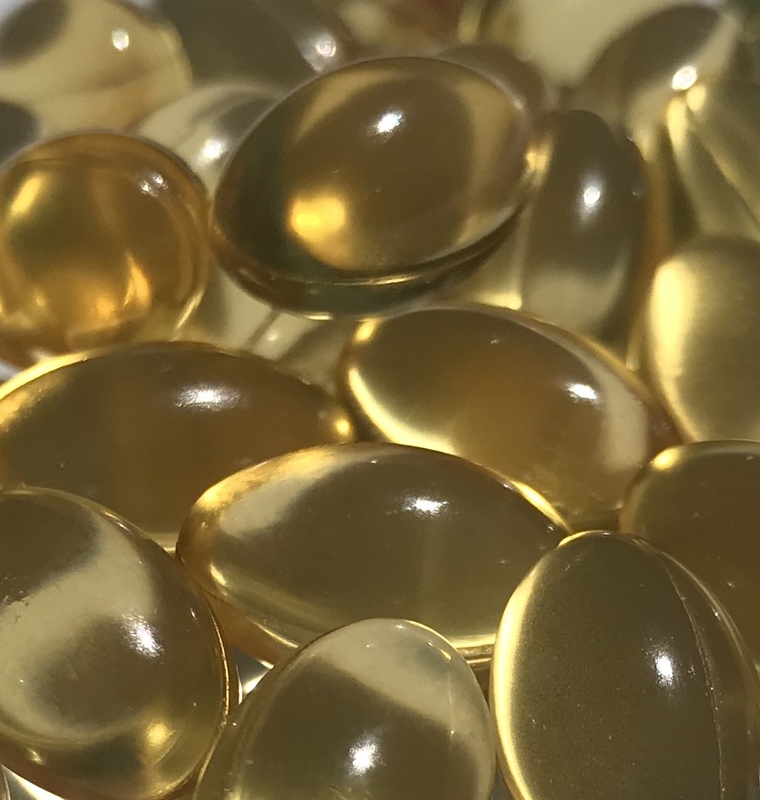 With all the ongoing research and development findings, the public’s growing acceptance of CBD and Hemp Extract products to alleviate a wide array of chronic issues has skyrocketed. It is a well known fact that most disease starts with inflammation, at a cellular level. 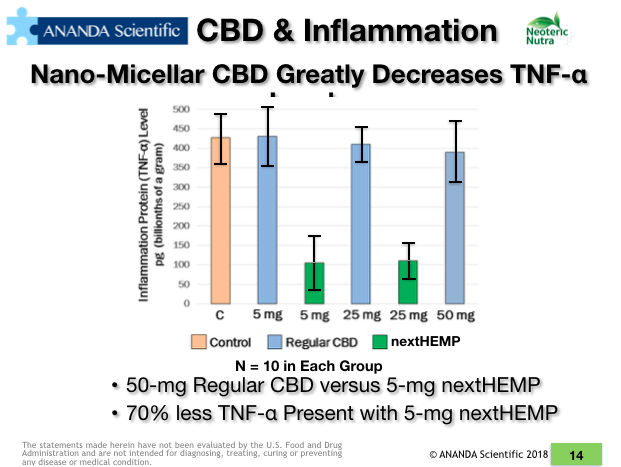 NEOTERIC NUTRA'S formulation has been proven to decrease the inflammation within swollen tissue 4x more than regular CBD. 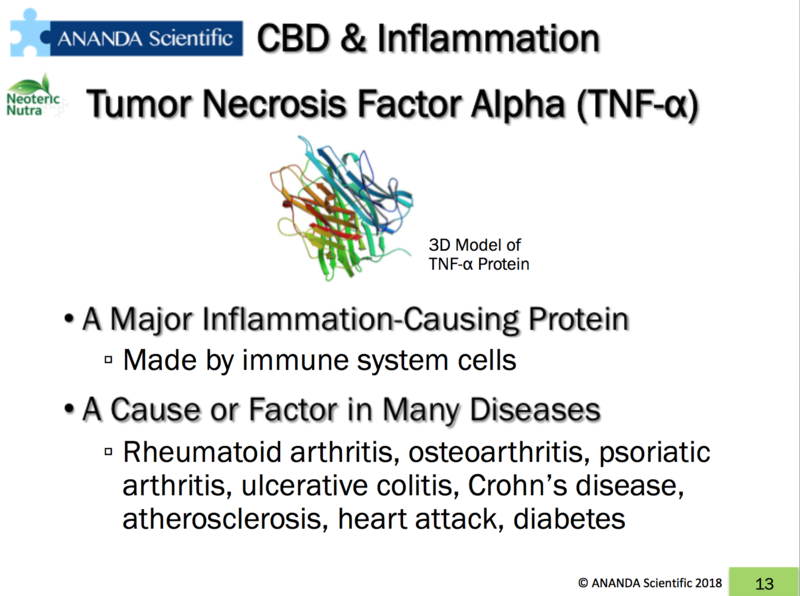 NEOTERIC NUTRA™ has scientific research (provided by Ananda Scientific) which shows the Tumor Necrosis Factor Alpha (a major inflammation-causing protein, made by immune system cells) greatly decreases this protein (up to 70%). Compared to other CBD products, in which they had little to no effect. See why everyone is choosing Neoteric Nutra as their safe alternative to decreasing inflammation on all levels. NEOTERIC NUTRA HAS ZERO THC, nor will the formulation ever turn to THC when passing thru the digestive system. One of the only companies that offers this guarantee.